Experimente París como un lugareño y disfrute de un típico almuerzo parisino en este tour en grupos pequeños. Sumérgete en la cultura francesa mientras compras en el mercado local de alimentos; compre una variedad de quesos regionales, frutas frescas y delicias locales; luego disfrute de un delicioso almuerzo tipo picnic, acompañado de pan francés y vino. Auténtica experiencia local: compre en el mercado local de alimentos. Prueba los platos típicos franceses, vinos y especialidades regionales. 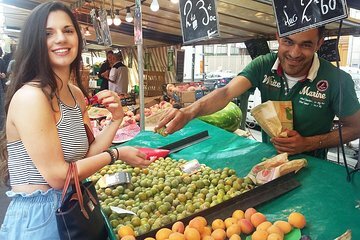 Aprende más sobre la cultura francesa y la cocina con un guía local. Experiencia personalizada con un pequeño grupo de hasta seis personas. Really enjoyed this authentic market experience! Milan showed helped us navigate a local market, taught us some helpful French phrases, and showed us around a neighborhood we probably wouldn’t have otherwise visited. Check out this tour if you like to get off the beaten track and enjoy some locally sourced food! My daughter (8) and I had a fabulous time. It was just the two of us. Milan took us to a market and taught my daughter how to buy things. Then we went to the park for a picnic. It was a great way to see Paris life and Milan went above and beyond to make sure we enjoyed ourselves. I highly recommend this tour and any others tha Milan does. It was wonderful! A absolutely wonderful experience! Milan was a fountain of information concerning not only the culinary aspects of our picnic and market visit, but also the history of Paris. The time flew by. Milan showed us everything in the market from the breads, to the cheeses to the meats and the wines and the fruit. What a delight for the senses! He then took us to a very nice park to enjoy our market delicacies. He is also an accomplished photographers and took many photos of us. Oh by the way, he speaks English perhaps better than I do. I highly recommend this tour without reservation and I know you will enjoy it thoroughly as well.